The missing link is generally understood to be the belief that there was a creature that once existed in the evolutionary chain and, if found, will bridge the gap between apes and humans. This concept is a popular one, widely recognized by the public and the media, though somewhat avoided by the scientific community. I suspect this is because the transition from ape to man can only be illustrated and corroborated by a transitional fossil to demonstrate an exact half-way point between ape and man, which, in all likelihood will never be found. Creation and evolution are both views of history,ideas about the unobserved past, and both sides try to marshal evidence in their favour. Creationists say that each category of living thing was created separately, therefore there never was one missing link. 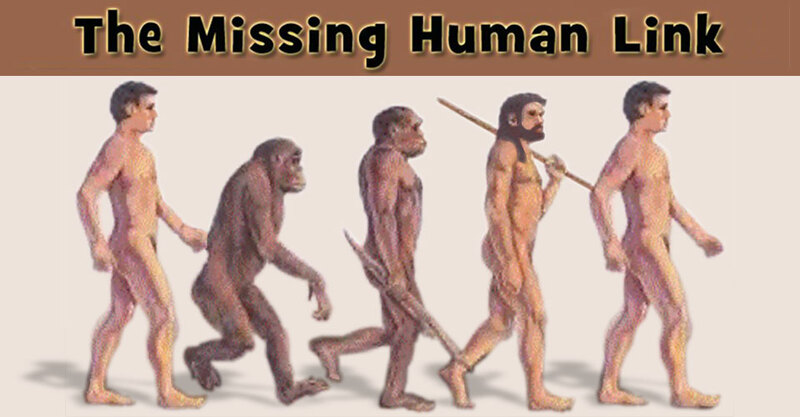 Evolutionists say the human link did exist whether a fossil is found or not. Thus far both their efforts have been in vain, and according to the channelled writings of the Washington, D.C. lawyer, James E. Padgett they will remain so. Padgett's unique spirit communications originate from spirits who are in a position to know these secrets and have communicated them to him through the means of automatic writing. The missing link then is actually man himself before his fall and devolution. When he reached the lowest point all that remained that was human on the earth was carried in the genetic code of certain apes. It was from there that the apeman through the process of evolution was restored back to human. If you are a person who likes thought-provoking ideas, then I invite you to read this narrative.